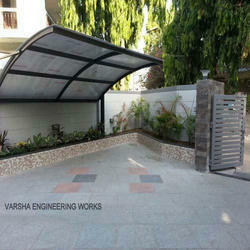 Manufacturer & Trader of Car Shed. Our product range also comprises of Fabrication & Maintenance Works, Rolling Shutters and Steel Railings. 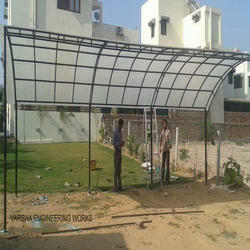 We have established ourselves as leading manufacturers, traders and suppliers of Car Shade in the market at present. These shades are formed from profiled coated steel and incorporate insulation to meet building regulation requirements. As the cladding systems typically span 3m, they are supported by secondary members, which transfer the loading to the rafters and columns. For the roof, these members are called purlins; for the walls, they are called cladding rails. 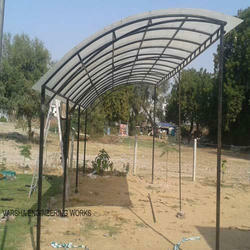 Steel portal frames are used for car sheds, the portal frames support the external envelope of the building. As a leading manufacturer, trader and supplier of Parking Car Shed, we have achieved great laurels for our company. These sheds from our end are made up in the box type and are easy to assemble, re-assemble and de-assemble. These are made in a number of different sizes, dimensions and specifications as well. These are efficient enough to provide protection from all the external factors. 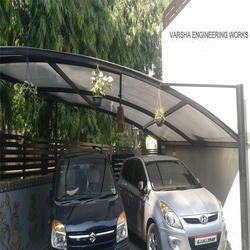 Our company has earned great laurels as manufacturers, traders and suppliers of Residential Car Shed. The sheds designed by our skilled team are thoroughly checked on the parameters like dimensions, sturdiness and durability. These are made available to the customers at industry leading rates. 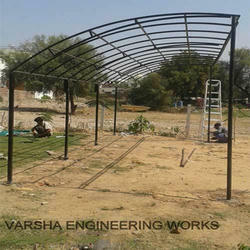 These are provided as per the set industry norms and guidelines. These sheds from our side are provided in a number of different sizes in order to fulfil the varied need of our customers.